5 Tips To Pick The Best Chest Freezer for Garage in 2019! A garage chest freezer is a very useful asset to have around the home. Essentially, these boxes are used to store all the products you want to keep that cannot fit into a standard freezer unit. Such as meat, ice-cream, and boxes of your favorite frozen foods. Sometimes buying in bulk is better, but you need somewhere to store it all. This is a review of the five best chest freezers for your garage, and any one of these items will provide you with the necessary chill to enjoy life. 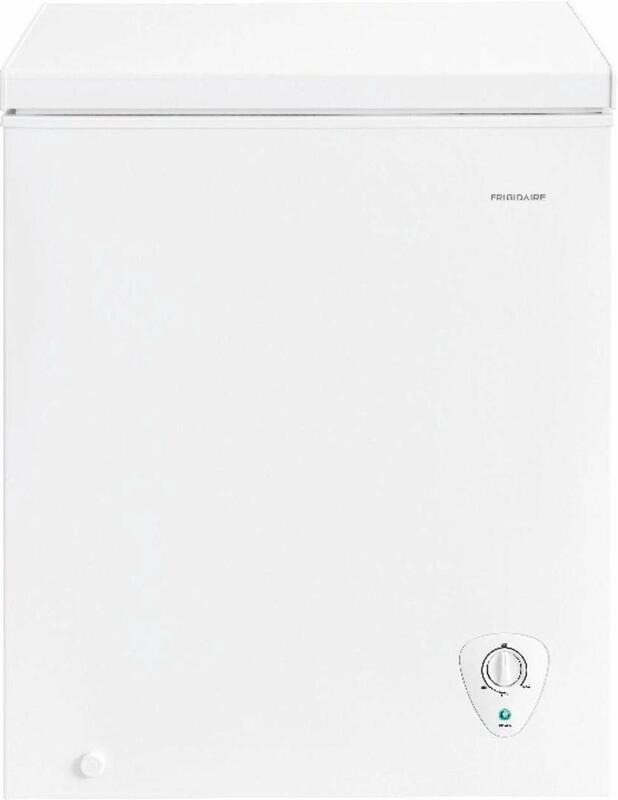 This is the Frigidaire FFFC05M2UW, 5 Cu. Ft. 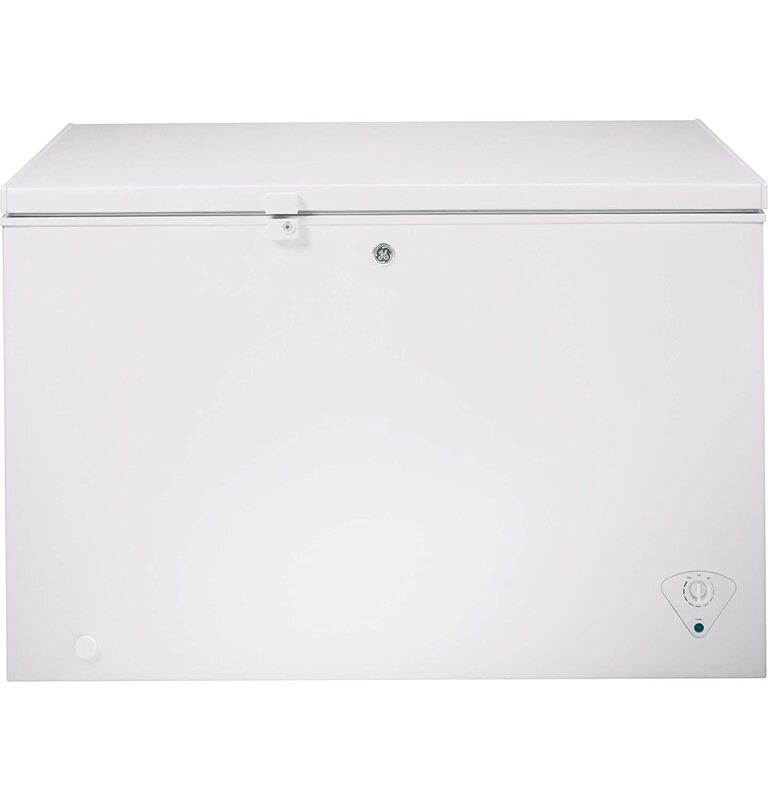 Chest Freezer, it’s a standard box, with 28-7/8″ W x 20-11/16″ D x 33-5/8″ H.
What you get with this chest freezer is a Power-on Indicator Light, so you know when the unit is working. A Defrost Water Drain which is extremely important for those monthly cleanups. Yes, food does drip, and when you get power shortages, freezers are prone to melt the contents. You also get the Adjustable Temperature Control that lets you decide what temperature you prefer to store your produce, and there is a Removable Storage Basket, which makes organizing your space that much easier. This model’s Annual Cost is rated at (.1065 / kWH) 26, and the annual energy consumption is 218 kWh. Storage space is 5 Cu. Ft.
It’s a chest, its 5 cubic feet and its simple. Plug it in, set the temperature, place the product and enjoy life. No hassles, no hustles, simple and easy to maintain. This is the Haier HF50CM23NW 5.0 Cu. Ft. Chest Freezer that holds up to 175 Lbs. of food. This model comes with ample storage space and has an Adjustable Thermostat Control that lets you control your freezer temperature. You also get an Easy-Access Defrost Drain, which is a must for any chest freezer unit, and you get a special Space-Saving, Flat-Back Design which is optimized for small spacers. This chest comes with a Manual Defrost for simple, easy management and cleaning, and a Removable Basket for an efficient storage solution. The annual energy consumption is set to 216.0 kWh, and the overall storage capacity is 5 cubic feet. 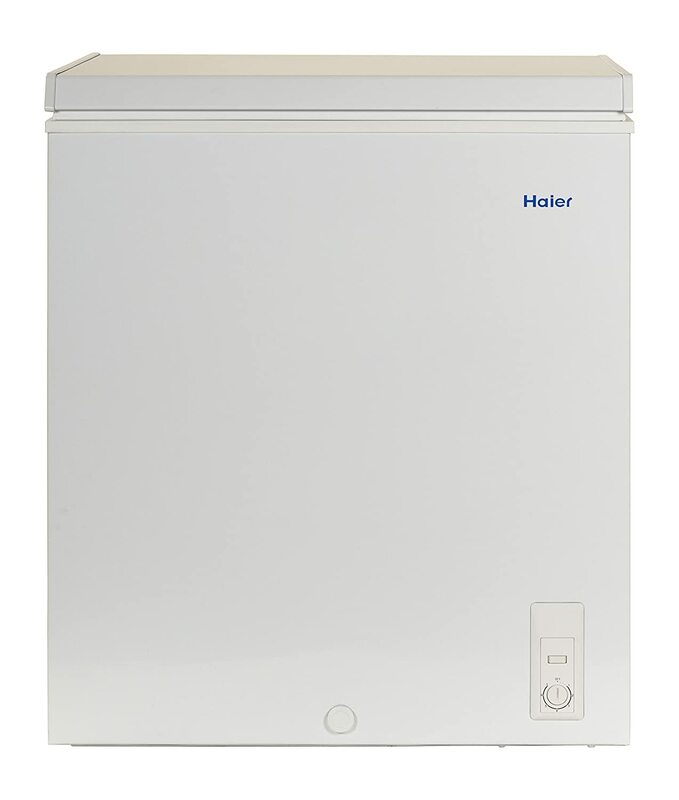 The Haier is another simple chest freezer, and you get the standard features of a manual to defrost with controllable temperature. All in all, a simple but efficient unit. This larger unit’s dimensions are	33 ½” H x 21 ¼” D x 37 ¼”. GE is a champion of freezers and storage devices, this is no exception to their exceptional product range, and is, in my opinion, the best medium-sized chest freezer on the market today. The GE® ENERGY STAR® 10.6 Cu. 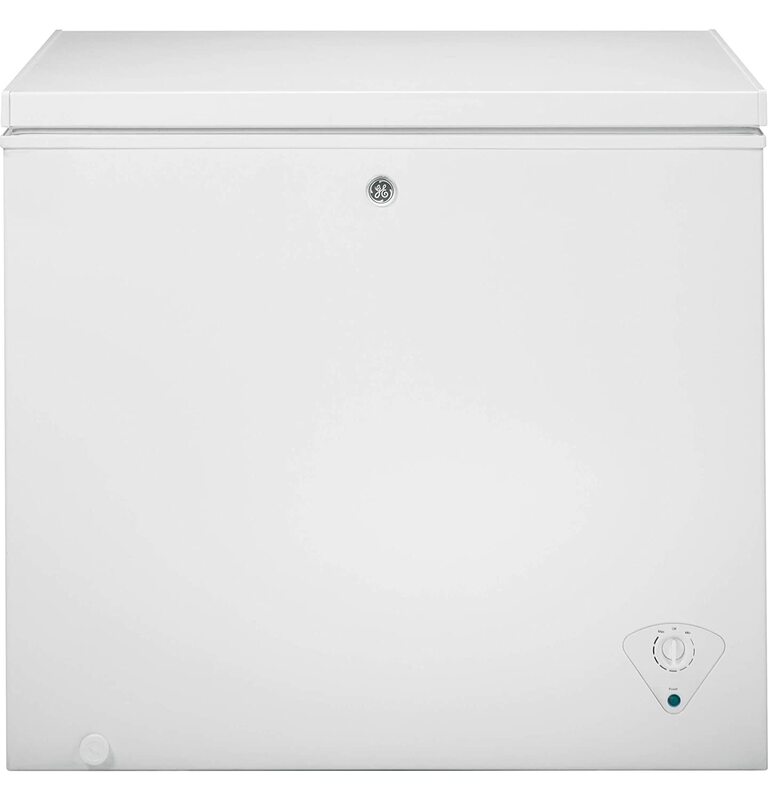 Ft. Manual Defrost Chest Freezer FCM11PHWW is a larger chest for Garages. This chest is another GE model designed to be Garage ready and comes with adjustable temperature control. This model holds up to 10.6-cubic feet and has 3 lift-out, sliding bulk storage baskets, making storage that much more organized and efficient. The power on light shows you where the unit is working or not, and the box comes with recessed handles. It also comes with internal lighting that provides an easier view in darker conditions. This larger GE model is even better for your garage if you have the space for it, one of these will let you prepare for any event, even Doomsday, which you can celebrate with a 10.6 cu.ft freezer of delicious produce to BBQ. 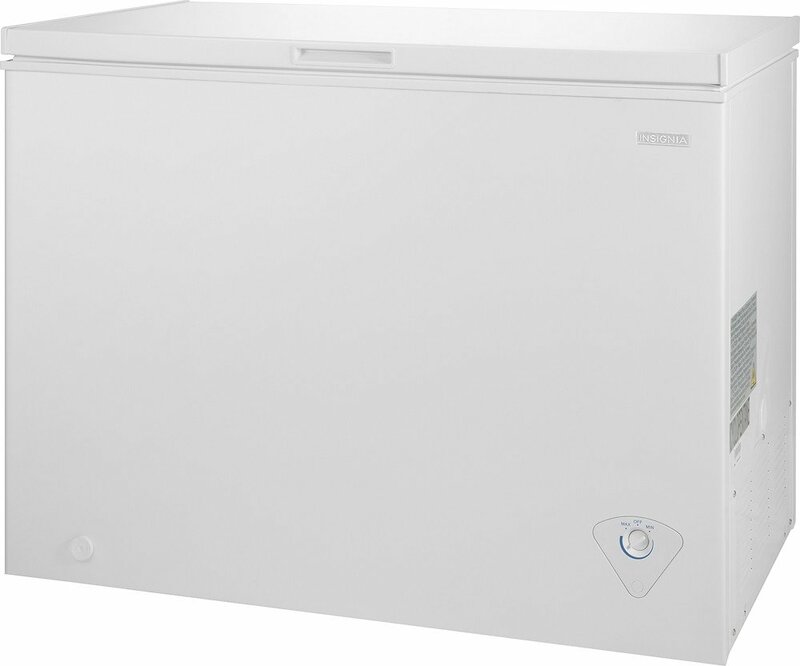 The Insignia™ Chest Freezer is a 10.2 cu. ft. the storage unit that comes with a Counter-balanced hinge Door that is opened and stays open at the angles you set, which is between 45 to 75 degrees. This model comes with one removable wire storage basket, so you can arrange and organize your interior more efficiently, and there is a standard Defrost drain. You do get Adjustable leveling legs to make sure the machine is flush with the floor, but level horizontally, and the temperature control is a Mechanical dial for simple setting control. There is a Power-on indicator light, and the interior is easy to clean. This models dimension are 33.5” H x 43.9” W x 26.4” D, and it weighs 101 Lbs. Simple is good, simple is best, and this is a very simple, very nicely sized chest freezer for your garage. There are two types of standalone freezers on the market; these are the chest freezer models and the upright freezer models. Let’s take a closer look at the advantages and disadvantages of each type. Chest freezers provide a wide-open storage option. They come with horizontally hinged doors, or slider doors (dependent on the model) and most will come with some kind of divider or rack system to help with internal storage optimization. Chest freezers are energy efficient, more so than upright ones, and the way they defrost makes them more efficient too. Due to their insulation design, they retain cold much longer than upright units in moments of power outages. The final advantage is that they are quieter than upright models. Price wise, these models are much friendlier than uprights since they are designed to be frozen storage boxes and not multi-functional devices. The disadvantages when compared to upright models are in their footprint, which is much larger than an upright model. As such, they take up more floor space. They are also slightly harder to organize than upright models, and their organization is toward depth management, a vertical stacking system which makes compartmentalization a bigger issue than in the upright models. Upright freezers have some advantages over chest freezers, the first being their footprint which is much smaller than a chest. The second advantage is that they can store much more within the smaller footprint, and arrange the storage in a vertical manner. Internal storage options are many, and some freezers are designed to provide segregated temperature zones for different products, as such their temperature control capabilities outdo those o the chest models. The defrosting of some models can be manual, but can also be internally controlled to defrost single compartments. The final difference is in the finish, unlike chests that usually come in only two finishes, white or steel. The right models come in a variety of finishes and styles to suit specific tastes. The disadvantages of upright freezers are in the integrity of the design, where some compartments materials do break or crack over time. Upright units do not retain the cold as long as chests when there are power outages, and the internal structures (shelves, doors, bins) take up valuable space. Doors are an issue, closing is horizontal rather than vertical, so you can sometimes get doors that re-open or don’t seal properly. Due to their design, cooling is a louder and more expensive system than chests. Prices vary and can compete with chest freezers. While upright freezers do take up less space, it is a proven fact that nothing really beats a good old plain old box of cold. One garage chest freezer filled to the top with food, and when you shut that top door, the freezer is shut.